Winning can sometimes be expected; one of two teams will always win the Super Bowl, the Stanley Cup or the World Series. Occasionally, winning can be completely unexpected. The latter was the case for RC4 Wireless, headquartered in Raleigh, NC, with the firm’s RC5 EASS, a winner of a PLSN Gold Star Award. “Winning this award was a stunning surprise, truly a shock. Our RC5 family of products has been evolving for over 10 years, going all the way back to the first incarnation for Harrah’s Casinos around 2007, and the second version for Disneyland park-wide in 2008. After all this hard work, a PLSN Gold Star Award really makes an impact on me, and on all of us at RC4 Wireless; we appreciate the recognition immensely. Many thanks to PLSN for noticing the special things we do for our customers every day,” says James David Smith, President and Chief Developer at RC4 Wireless. 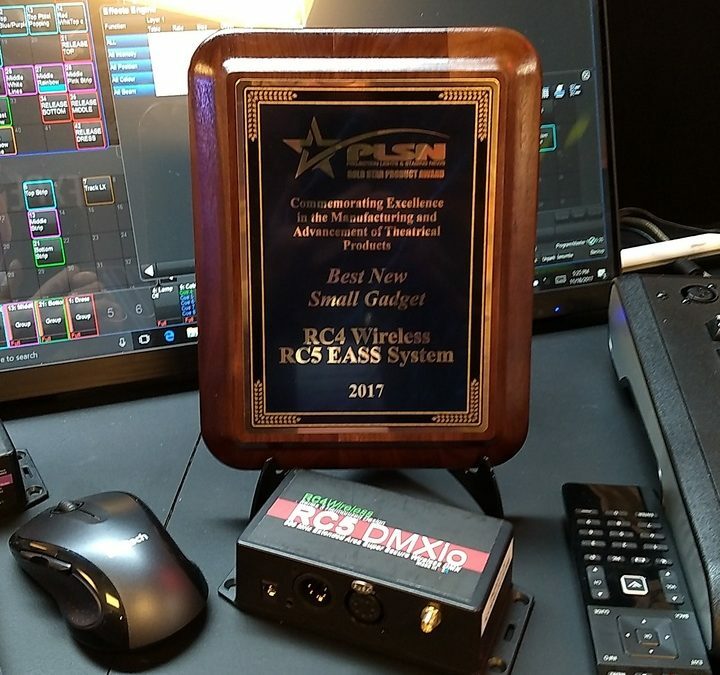 PLSN’s Lead Editor Richard “Nook” Schoenfeld was the one who made the final decision on the EASS Gold Star Award; the product itself wasn’t the only part of the winning equation. “I have never heard one single person ever say your gear let them down. Not once. That’s pretty incredible in this day and age,” Schoenfeld notes. EASS—which stands for Extended Area Super Secure— provides virtually hack-proof security for theme parks, ski resorts, arenas, convention centers, casinos, and other public areas via three different security protocols. EASS uses 256-bit AES encryption, RC4 Private System IDs and user-selectable FHSS frequency-hopping provide wireless DMX protection on multiple levels, keeping wireless lighting super secure and worry-free. For more information, or to purchase EASS, please contact RC4 Wireless Toll-Free at 1-866-258-4577 or email at moreinfo@rc4wireless.com.